Watch a DNA molecule twist and writhe in the electrokinetic trap. See the electrokinetic trap moving a DNA molecule around. Listen and watch how sound waves affect fluorescent polystyrene microparticles. How do you get a molecule to stop jiggling long enough to get a good look at it? It's a problem that has vexed biologists for years. 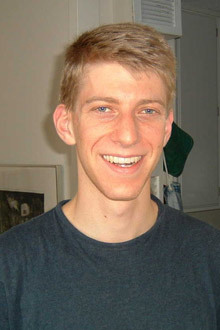 But Adam Cohen, who worked on it for the last four years as a graduate student at Stanford University, has solved it. Tiny objects, such as cells, viruses, and proteins, naturally flitter about in solution. It's called Brownian motion, and Albert ­Einstein explained it more than a century ago: particles in solution are invisibly bumped by water molecules. Researchers have been largely powerless to stop the jiggling of particles smaller than 100 nanometers, making it difficult to directly observe, for example, a single protein in its natural environment. By developing a method for gently stopping the motion of nanoparticles, Cohen has given scientists a way to more easily discern differences between individual molecules and determine how those differences affect biological processes. Cohen points out that biological molecules like proteins exhibit "lots of variability." That variability--say, how an odd protein is misshaped--can have important medical implications. Optical tweezers, invented in the mid-1980s, use lasers to trap objects in solution by exerting a force on them. This technique works well with objects larger than 100 nanometers, but Cohen knew that a laser trained on something as small as a protein would "cook it rather than trap it." So he turned to electrokinetic forces. Cohen traps his molecules using a microfluidic chamber lined with electrodes. The microfluidic device is mounted under a standard f­luorescence microscope that sends images of the targeted nanoparticle to a PC, which quickly determines the exact location of the molecule and applies voltages to the tiny chamber. These precisely calibrated voltages create minuscule drifts in the fluid that cancel out the Brownian motion of the molecule. "It's like balancing a broom pole on your palm," Cohen explains. "If you keep adjusting your palm, you can keep it balanced." Cohen begins work as an assistant professor of physical chemistry at Harvard University this fall. Now that his instrument works, he says, he is anticipating "the real excitement of making measurements on biological molecules."